It’s the week after Spring Break and everyone’s about back into “study mode”. Actually teachers are kicking into high gear in preparation for AP exams. However, that didn’t stop us from going out to eat. Normally, we’d go to Thumb Plaza, but my mom agreed to take me to the Kerry. There’s a chic vegetarian restaurant I’ve always wanted to go to. Yesterday was the perfect chance. Pure and Whole for the win!!! We arrived at around 6:20, but the restaurant was pretty empty. I was pretty worried until I saw the pile of orders on the counter. Apparently, they have a pretty booming delivery service. The menu was small but extremely varied. There were appetizers, soups, seasonal salads, pasta, curry, burgers and dessert- all vegan for the most part. Unlike most restaurants in China, Pure and Whole published it’s menu on it’s website (click here). As much as we would like to have sampled the fresh and beautifully plated appetizers and salads, it was only the two of us, so we stuck to entrees. I must say I was a bit disappointed. The bun was disproportionally thick; the “patty” was a bit bland and small. There was also a strange creamy spread that I didn’t like. However, I must say that everything was amazingly fresh and well cooked. The actual star of the show was the little cup of pickled vegetables- perfectly vinegary and crunchy. This dish is honestly one of the healthiest, but still delicious dinners ever. 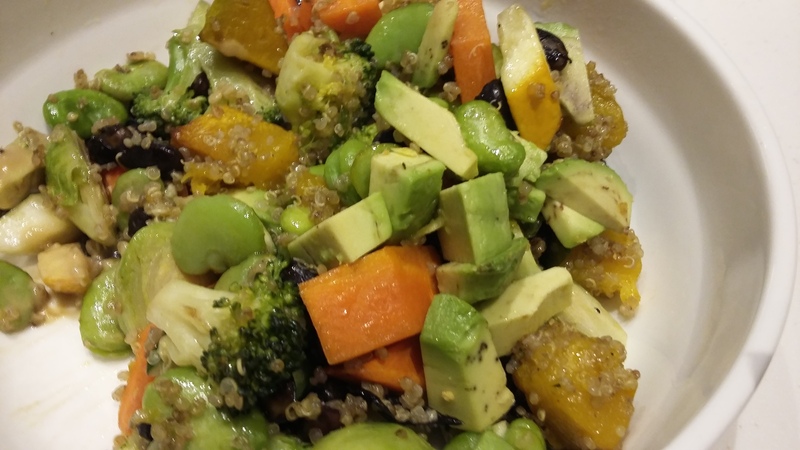 It’s basically a mix of a bit of quinoa, pumpkin, broccoli, carrots, beans and avocado. It came with a sauce on the side, but that was way too salty. The portion was also quite generous, almost enough for 2 people. 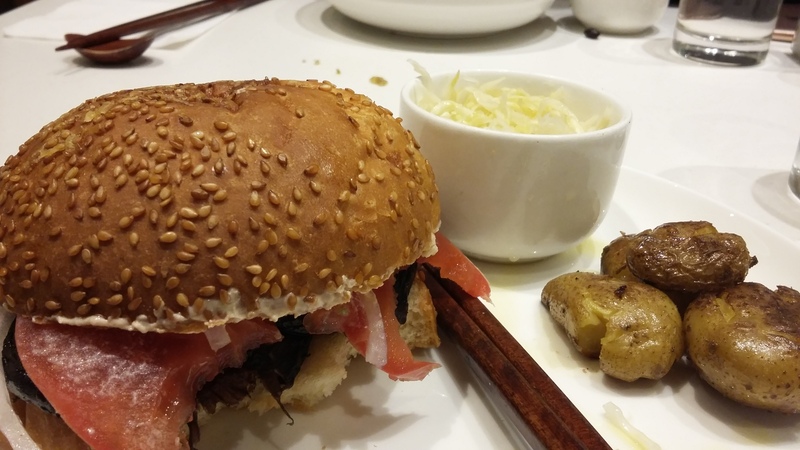 Side note: The food was quite expensive, 68rmb for my burger and 72rmb for the quinoa bowl. The food was good, but the service was a bit lacking. Our food came slowly and I felt ignored by the servers. On several occasions, I noticed dishes ready and servers free, but a delay in bringing the dishes out. On a positive note, their attitude was very good and they gave me a free serving of that amazing pickled cabbage. 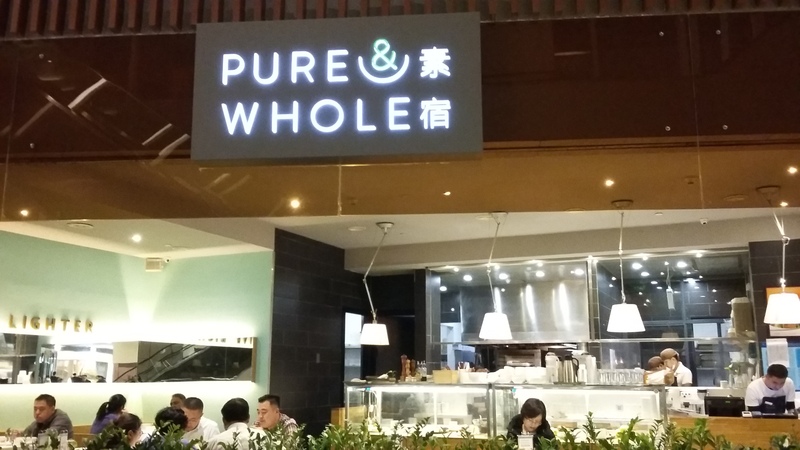 Overall, Pure & Whole is a great place for fresh, healthy, vegetarian food- a jewel in China’s often pork and oil obsessed dining scene. I would love to try some other items, especially the vegetable masala, spring rolls and black bean burger.